An all-in-one noise ‚voice‘. 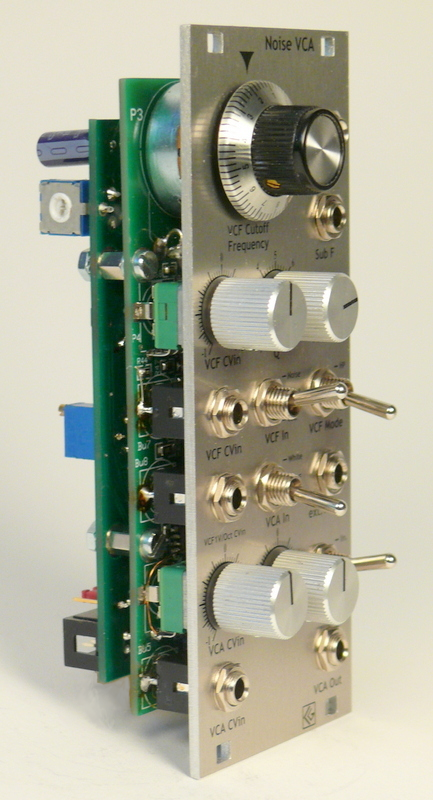 A white noise generator followed by a state-variable VCF (switchable between band-, high-, or lowpass characteristic) with adjustable resonance (Q) and a VCA makes this module ideal for most standard noise applications. The integrated filter provides a wide range of rich and colourful noise sounds. The VCF has a 2nd input, allowing one to combine external audio with noise, or to replace the VCF’s noise input completely with an external source. Further, there is a sub audio output providing a random CV for modulations. 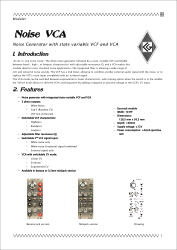 The VCA’s CV mode can be switched between exponential or linear characteristic, with a muting option when the switch is in its middle position; the ‚Offset‘ knob allows one to shift the VCA’s start point by adding a negative or positive voltage to the VCA’s CV input. White Noise; VCF out with LFO cutoff frequency modulation and varying settings of Q. Noise VCA (VCF LFO-modulated) followed by Delay1022 . Noise VCA (White Noise VCA Out) followed by Delay1022 (filtered with Noise VCA VCF) . Noise VCA with VCF ext. In: XR22VCO FT; VCA Out (White Noise) followed by Delay1022. In this standard patch the Peak&Hold’s ‚Release‘ output controls the VCA with a dynamic envelope shape, while the Peak&Hold’s ‚P+H‘ output is modulating the VCF’s cutoff frequency. In this example the XR22 VCO FT’s squarewave output is applied to ‚ext VCF In‘; the Peak&Hold is modulating the Noise VCA’s VCF cutoff frequency and the VCA. Short impulse signals can be used to trigger the VCF, generating ‚ping‘ like sounds. Here the Peak&Hold’s impulse output is used to trigger the VCF; its ‚P+H‘ output is modulating the filter’s cutoff frequency. When using the VCA with white noise (or Sub F) as signal source, the VCF can be used completely independent to process another signal; or the VCA can generate dynamic accents to the 1st (VCF) audio output – by shifting the VCA’s offset level. Here the VCF’s audio input is the impulse-triggered Delay 1022. The ‚Sub F‘ output can be used to modulate the VCF cutoff frequency and/or the VCA – random sounds such as ‚thunder‘ or ‚crackling‘ can be generated.